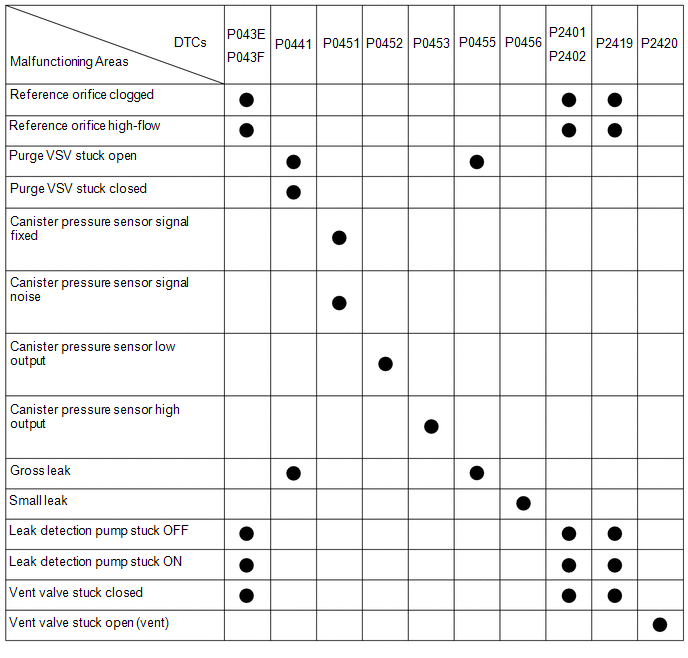 If any EVAP system DTCs are stored, the malfunctioning area can be determined using the table below. If the reference pressure difference between the first and second checks is more than the specification, all the DTCs relating to the reference pressure (P043E, P043F, P2401, P2402 and P2419) will all be stored. The canister pressure sensor, the leak detection pump and the vent valve are built into the canister pump module. 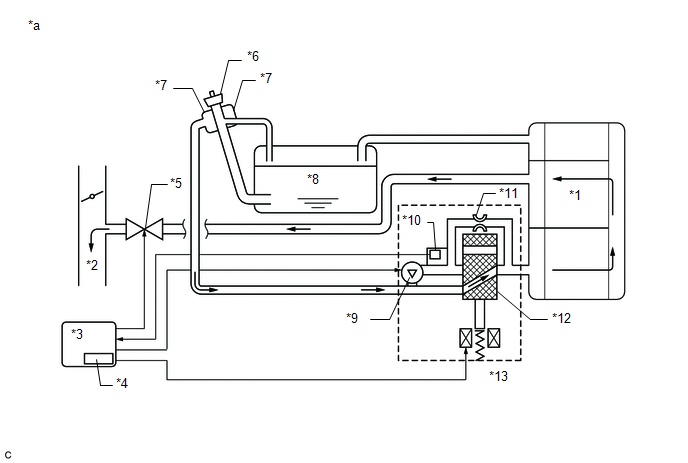 In the EVAP system of this vehicle, turning ON the vent valve does not seal off the EVAP system. To check for leaks in the EVAP system, disconnect the air inlet vent hose and apply pressure from atmospheric side of the canister. While the engine is running, if a predetermined condition (closed-loop, etc.) is met, the purge VSV is opened by the ECM and fuel vapors stored in the canister are purged to the intake manifold. 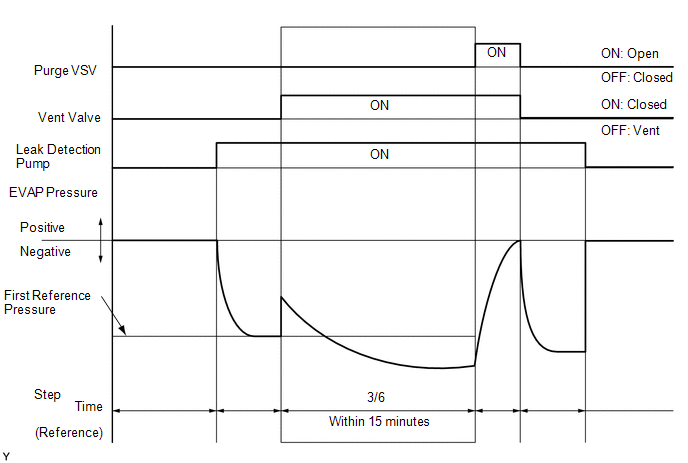 The ECM changes the duty cycle ratio of the purge VSV to control purge flow volume. The purge flow volume is also determined by the intake manifold pressure. Atmospheric pressure is allowed into the canister through the vent valve to ensure that the purge flow is maintained when negative pressure (vacuum) is applied to the canister. The following two monitors run to confirm appropriate EVAP system operation. This monitor checks for EVAP (evaporative emission) system leaks and canister pump module malfunctions. The monitor starts 5 hours* after the ignition switch is turned off. At least 5 hours are required for the fuel to cool down to stabilize the EVAP pressure, thus making the EVAP system monitor more accurate. 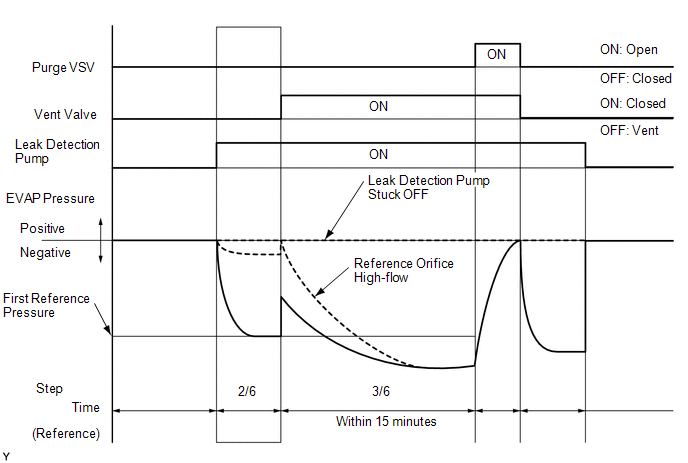 The leak detection pump creates negative pressure (vacuum) in the EVAP system and the pressure is measured. Finally, the ECM monitors for leaks from the EVAP system, and malfunctions in both the canister pump module and purge VSV based on the EVAP pressure. *: If the engine coolant temperature is not below 35°C (95°F) 5 hours after the ignition switch is turned off, the monitor check starts 2 hours later. 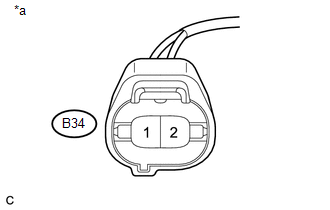 If it is still not below 35°C (95°F) 7 hours after the ignition switch is turned off, the monitor check starts 2.5 hours later. The purge flow monitor consists of the 2 monitors. The 1st monitor is conducted every time and the 2nd monitor is activated if necessary. 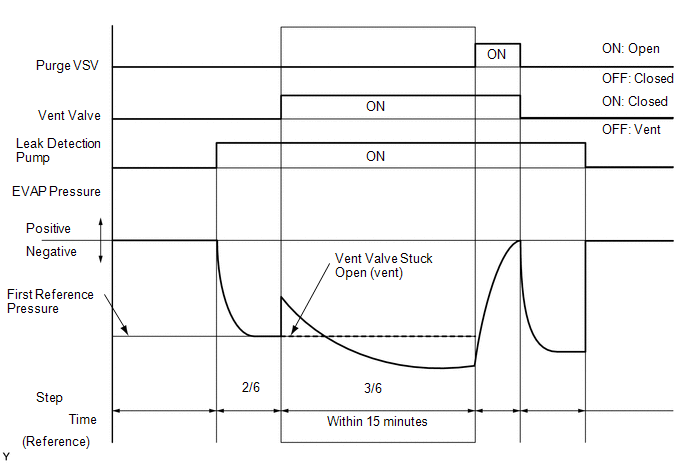 While the engine is running and the purge VSV (Vacuum Switching Valve) is on (open), the ECM monitors the purge flow by measuring the EVAP pressure change. If negative pressure is not created, the ECM begins the 2nd monitor. The vent valve is turned ON (closed) and the EVAP pressure is then measured. If the variation in the pressure is less than 0.15 kPa(gauge) [1.125 mmHg(gauge)], the ECM interprets this as the purge VSV being stuck closed, and illuminates the MIL and stores DTC P0441 (2 trip detection logic). In order to ensure reliable malfunction detection, the variation between the atmospheric pressures, before and after of the purge flow monitor, is measured by the ECM. Contains activated charcoal to absorb EVAP (Evaporative Emissions) generated in fuel tank. Located in fuel tank. Valve floats and closes when fuel tank is 100% full. Located in fuel tank. Valve closes by its own weight when vehicle overturns to prevent fuel from spilling out. Built into ECM. To ensure accurate EVAP monitor, measures 5 hours (+/-15 min) after ignition switch is turned off. This allows fuel to cool down, stabilizing EVAP pressure. When approximately 5 hours elapsed, ECM activates (refer to fig. 3). Consists of (a) to (d) below. Canister pump module cannot be disassembled. Vents and closes EVAP system. When ECM turns valve on, EVAP system is closed. When ECM turns valve off, EVAP system is vented. 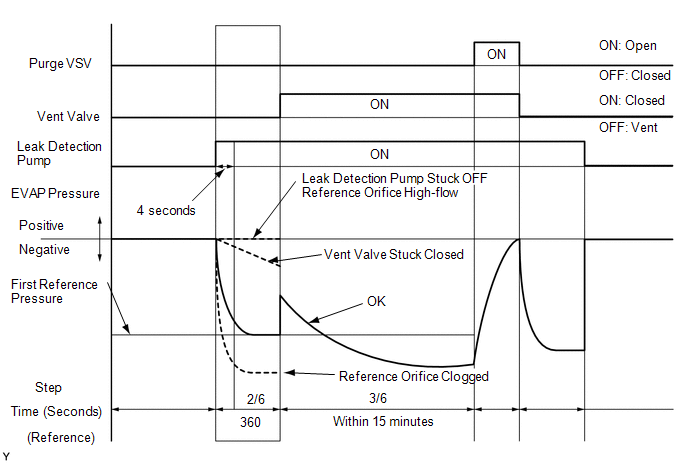 Negative pressure (vacuum) is created in EVAP system to check for EVAP leaks by closing purge VSV, turning on vent valve (closing it) and operating leak detection pump (refer to fig. 1). Indicates pressure as voltages. 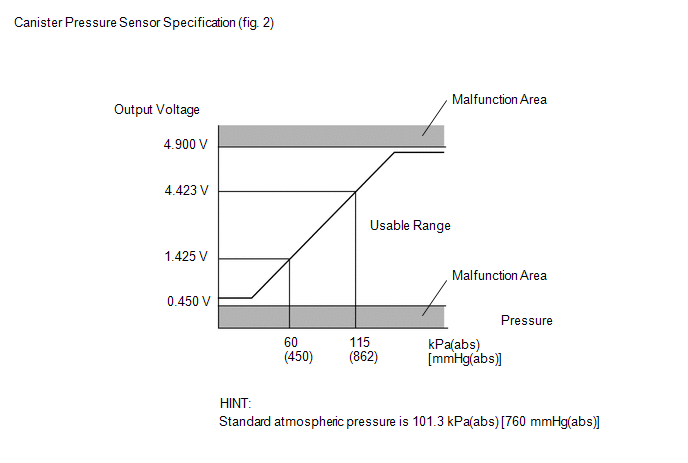 ECM supplies regulated 5 V to pressure sensor, and uses feedback from sensor to monitor EVAP system pressure (refer to fig. 2). Creates negative pressure (vacuum) in EVAP system for leak check. Has opening with 0.02 inch diameter. Vacuum is produced through orifice by closing purge VSV, turning off vent valve and operating leak detection pump, to monitor reference pressure. Reference pressure is used when checking for small EVAP leaks. After a repair, check Monitor Status by performing the Key-Off Monitor Confirmation and Purge Flow Monitor Confirmation described below. The vehicle has been driven for 10 minutes or more (in a city area or on a freeway). The fuel tank is less than 90% full. The altitude is less than 7875 ft. (2400 m). The engine coolant temperature is between 4.4°C and 35°C (40°F and 95°F). The intake air temperature is between 4.4°C and 35°C (40°F and 95°F). The vehicle remains stationary (the vehicle speed is 0 km/h [0 mph]). Allow the engine to idle for at least 5 minutes. Turn the ignition switch off and wait for 6 hours (8 or 10.5 hours). Do not start the engine until checking Monitor Status. If the engine is started, the steps described above must be repeated. Enter the following menus: Powertrain / Engine / Monitor / Current Monitor. Check the Monitor Status displayed on the Techstream. If Incomplete is displayed, the monitor did not complete. Make sure that the preconditions have been met, and perform the Monitor Conditions again. 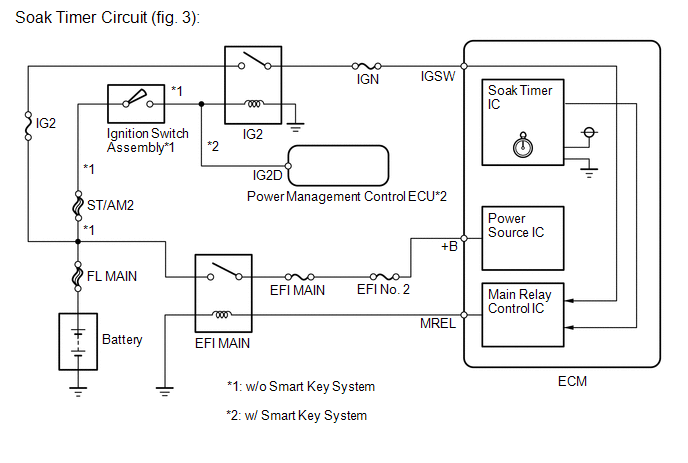 Perform this monitor confirmation after the Key-Off Monitor Confirmation shows Complete. The engine coolant temperature is 4.4°C (40°F) or higher. The intake air temperature is 4.4°C (40°F) or higher. Release the pressure from the fuel tank by removing and reinstalling the fuel cap. Warm the engine up until the engine coolant temperature reaches more than 75°C (167°F). Increase the engine speed to 3000 rpm once. Allow the engine to idle and turn the A/C switch on for 1 minute. Turn the ignition switch off (if ON or if the engine is running). Inspect the fuses for circuits related to this system before performing the following inspection procedure. The Techstream is required to conduct the following diagnostic troubleshooting procedure. Using the Techstream monitor results enables the EVAP (Evaporative Emission) system to be confirmed. Read freeze frame data using the Techstream. The ECM records vehicle and driving condition information as freeze frame data the moment a DTC is stored. When troubleshooting, freeze frame data can help determine if the vehicle was moving or stationary, if the engine was warmed up or not, if the air fuel ratio was lean or rich, and other data from the time the malfunction occurred. (a) Turn the ignition switch off and wait for 10 seconds. (c) Turn the ignition switch off and wait for 10 seconds. (d) Connect the Techstream to the DLC3. (e) Turn the ignition switch to ON and turn the Techstream on. (f) Enter the following menus: Powertrain / Engine / Trouble Codes. (g) Confirm DTCs and freeze frame data. If the reference pressure difference between the first and second checks is greater than the specification, all the DTCs relating to the reference pressure (P043E, P043F, P2401, P2402 and P2419) are stored. 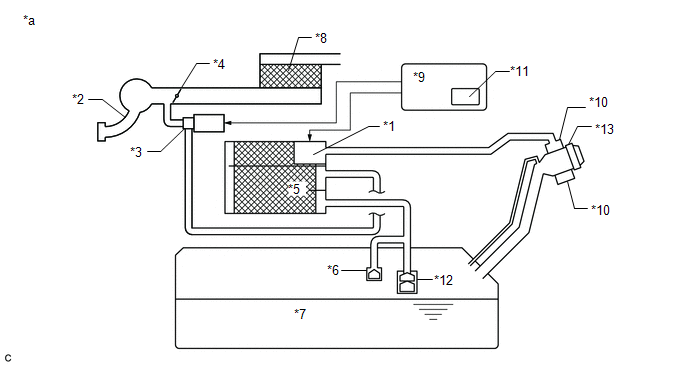 The Evaporative System Check (Automatic Mode) consists of 6 steps performed automatically by the Techstream. It takes a maximum of approximately 24 minutes. Do not perform the Evaporative System Check when the fuel tank is more than 90% full because the cut-off valve may be closed, making the fuel tank leak check unavailable. Do not run the engine during this operation. When the temperature of the fuel is 35°C (95°F) or more, a large amount of vapor forms and any check results become inaccurate. When performing the Evaporative System Check, keep the temperature below 35°C (95°F). (d) Clear DTCs (See page ). (e) Enter the following menus: Powertrain / Engine / Utility / Evaporative System Check / Automatic Mode. (f) After the Evaporative System Check is completed, check for pending DTCs by entering the following menus: Powertrain / Engine / Trouble Codes. If no pending DTCs are displayed, perform the Confirmation Driving Pattern. After this confirmation, check for pending DTCs. If no DTCs are displayed, the EVAP system is normal. In the Evaporative System Check (Manual Mode), the series of 6 Evaporative System Check steps are performed manually using the Techstream. (e) Enter the following menus: Powertrain / Engine / Utility / Evaporative System Check / Manual Mode. (a) Check the EVAP pressure in step 1/6. *1: These DTCs are already present in the ECM when the vehicle arrives and are confirmed in the "Confirm DTC" procedure above. 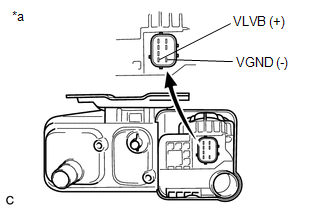 *2: If the canister pressure sensor circuit has an open or short, DTC P0452 or P0453 is stored 0.5 seconds after the ignition switch is turned to ON. *3: Canister pressure sensor standard output range is 70 to 110 kPa(abs) [525 to 825 mmHg(abs)]. This varies by weather. (a) Check the EVAP pressure in steps 1/6 and 2/6. *: These DTCs are already present in the ECM when the vehicle arrives and are confirmed in the "Confirm DTC" procedure above. The first reference pressure is the value determined in step 2/6. Make a note of the pressures checked in inspection items (A) and (B) below. 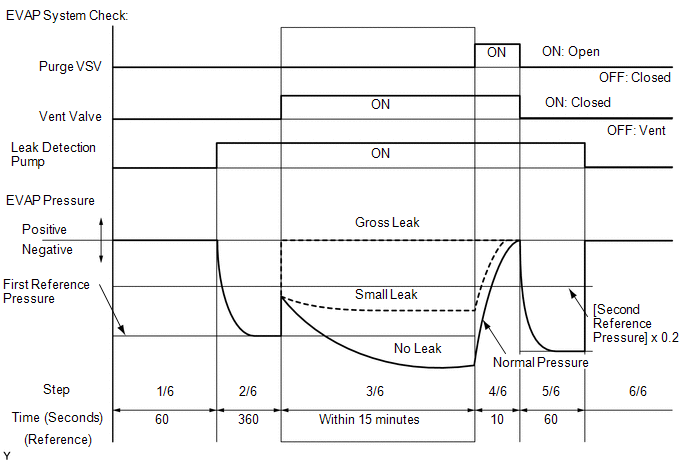 (a) Check the EVAP pressure 4 seconds after the leak detection pump is activated*1 (A). 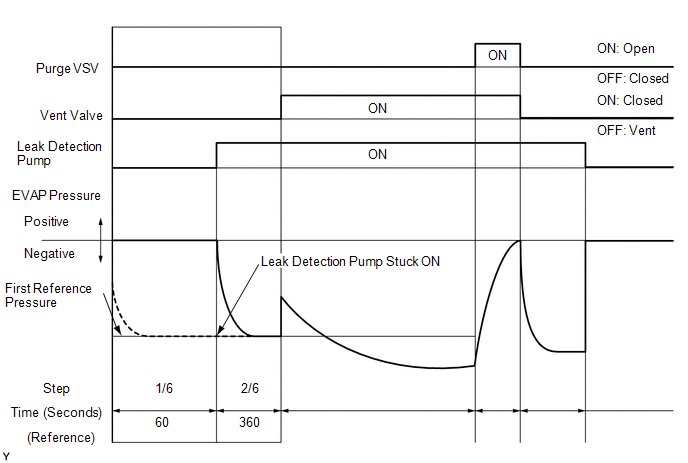 *1: The leak detection pump begins to operate as step 1/6 finishes and step 2/6 starts. (b) Check the EVAP pressure again when it has stabilized. This pressure is the reference pressure (B). *2: These DTCs are already present in the ECM when the vehicle arrives and are confirmed in the "Confirm DTC" procedure above. (a) Check the EVAP pressure in step 3/6. (a) Wait until the EVAP pressure change is less than 0.12 kPa(gauge) [0.9 mmHg(gauge)] for 40 seconds. (b) Measure the EVAP pressure and record it. A few minutes are required for the EVAP pressure to become saturated. When there is little fuel in the fuel tank, it takes up to 15 minutes. (a) Check the EVAP pressure in step 4/6. *2: This result suggests that due to purge line blockage or purge VSV malfunction, the DTC was stored by the purge flow monitor while the engine was running, or that key-off monitor test result were nearly borderline values. (a) Check the EVAP pressure in step 5/6. 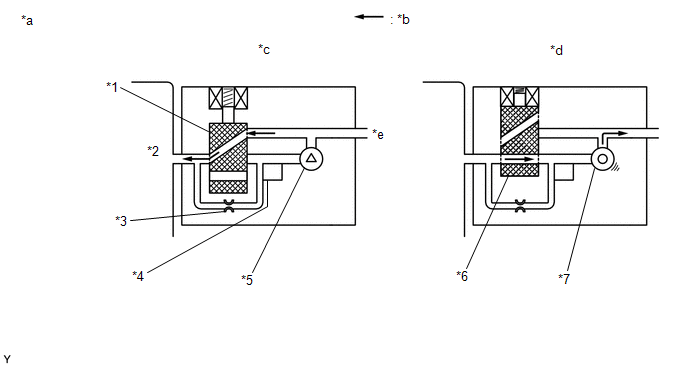 (b) Compare the EVAP pressure in step 3/6 and the second reference pressure (step 5/6). 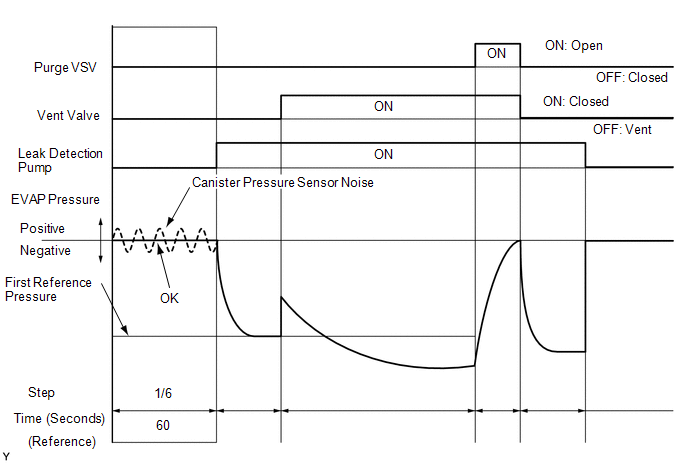 (a) Check the canister pressure sensor circuit, referring to DTC P0451 canister pressure sensor circuit inspection procedure (See page ). (b) Disconnect the canister pump module connector. 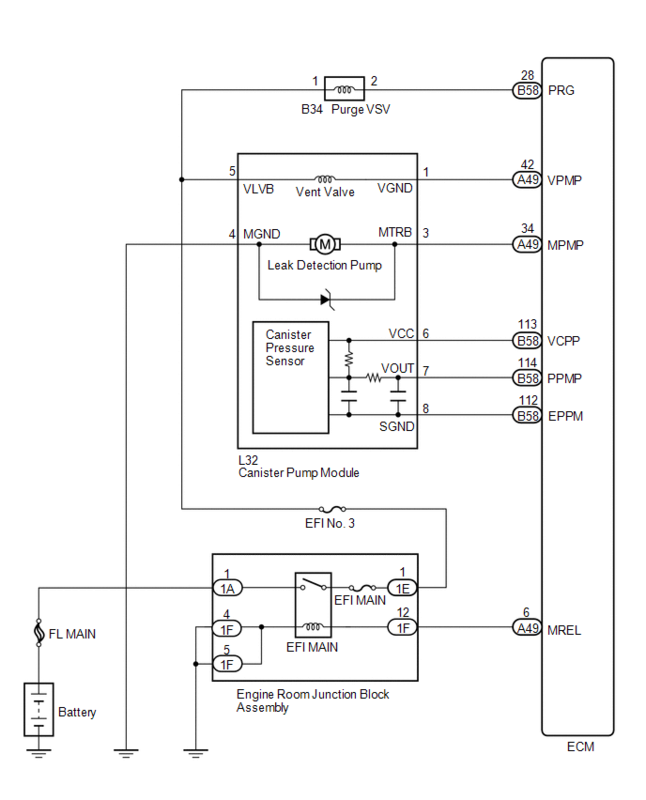 (c) Apply the battery voltage to terminals VLVB and VGND of the pump module. (d) Touch the canister pump module to confirm the vent valve operation. (c) Disconnect the ECM connector. (d) Measure the resistance according to the value(s) in the table below. (a) Disconnect the canister pump module connector. (b) Disconnect the ECM connector. 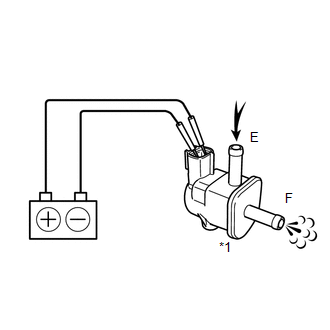 (a) Enter the following menus: Powertrain / Engine / Active Test / Activate the VSV for EVAP Control. (b) Disconnect the hose (connected to the canister) from the purge VSV. 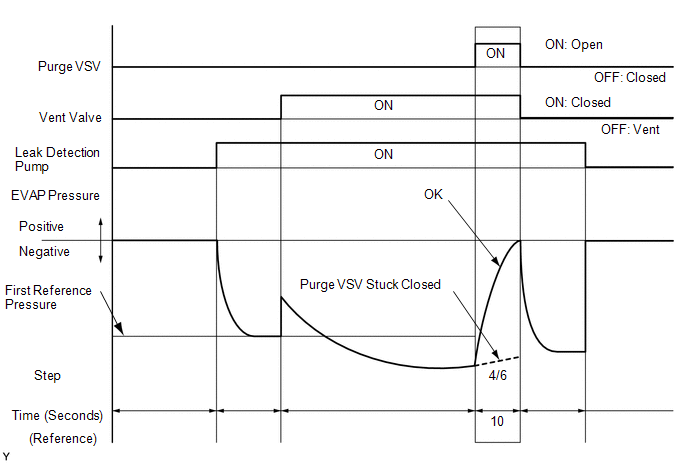 (d) Using the Techstream, turn off the purge VSV (Activate the VSV for Evap Control: OFF). (e) Use your finger to confirm that the purge VSV has no suction. (f) Using the Techstream, turn on the purge VSV (Activate the VSV for Evap Control: ON). (g) Use your finger to confirm that the purge VSV has suction. (a) Check for blockages in the EVAP purge line between the purge VSV and canister. No blockages in the EVAP purge line between the purge VSV and canister. (a) Check for filter blockage in the canister (See page ). No blockages in the canister. (a) Check that the fuel cap is correctly installed and confirm that the fuel cap meets OEM specifications. (b) Tighten the fuel cap firmly (only one click sound could be heard). If an EVAP tester is available, check the fuel cap using the tester. (1) Remove the fuel cap and install it onto a fuel cap adapter. (2) Connect an EVAP tester pump hose to the adapter, and pressurize the cap to 3.2 to 3.7 kPa(gauge) [24 to 27.75 mmHg(gauge)] using an EVAP tester pump. (3) Seal the adapter and wait for 2 minutes. (4) Check the pressure. If the pressure is 2 kPa(gauge) [15 mmHg(gauge)] or more, the fuel cap is normal. (b) Disconnect the purge VSV connector. (c) Disconnect the hose (connected to the canister) from the purge VSV. 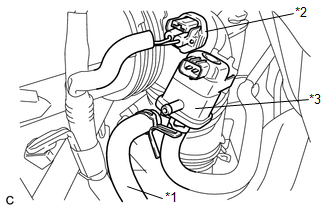 (a) Disconnect the hose (connected to the intake manifold) from the purge VSV. (c) Use your finger to confirm that the hose has suction. (a) Remove the purge VSV. (b) Apply battery voltage to the terminals of the purge VSV. 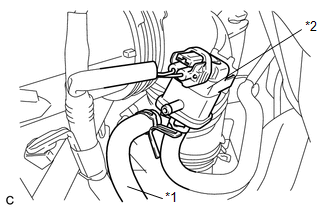 (c) Confirm that air flows from port E to port F.
(a) Disconnect the purge VSV connector. (d) Measure the voltage according to the value(s) in the table below. 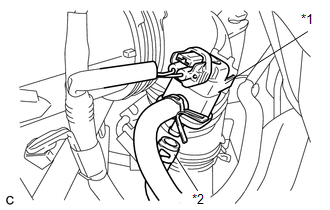 (b) Disconnect the EVAP hose from the intake manifold. (d) Use your finger to confirm that the port of the intake manifold has suction. When reinstalling the fuel cap, tighten it firmly (only one click sound could be head). When replacing the fuel cap, use a fuel cap that meets OEM specifications, and install it firmly. When installing the fuel cap, tighten it firmly (only one click sound could be head). (a) Disconnect the vent hose. (b) Connect the EVAP pressure tester tool to the canister pump module with the adapter. (c) Pressurize the EVAP system to 3.2 to 3.7 kPa(gauge) [24 to 27.75 mmHg(gauge)]. (d) Apply soapy water to the piping and connecting parts of the EVAP system. (e) Look for areas where bubbles appear. 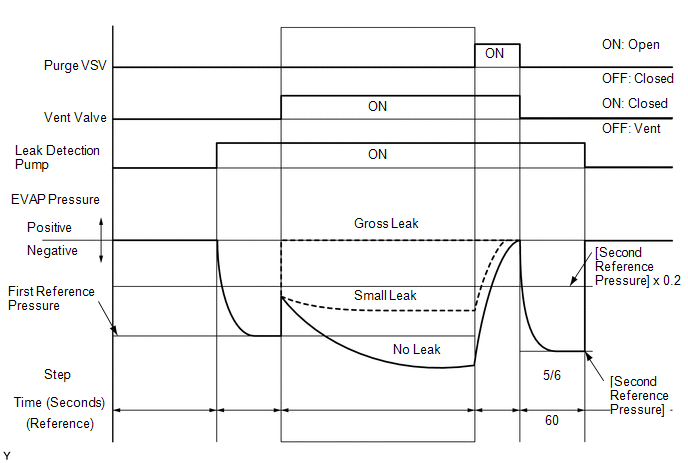 This indicates the leak point. (f) Repair or replace the leak point. Disconnect the hose between the canister and fuel tank from the canister. Block the canister side and conduct an inspection. 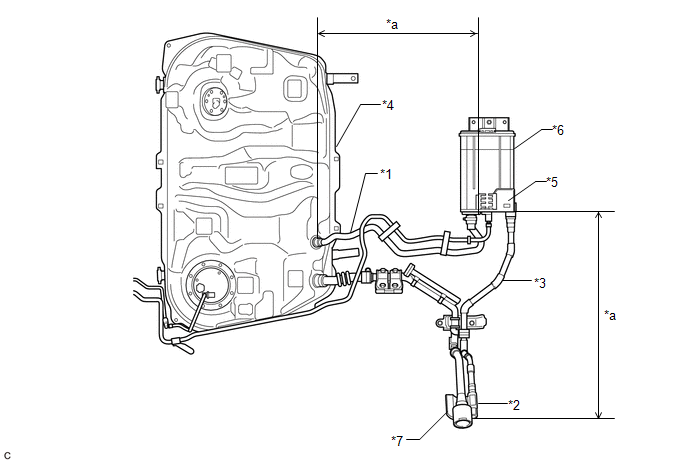 In this way, the fuel tank can be excluded as an area suspected of causing fuel leaks. (a) Replace the canister pump module (See page ). When replacing the canister pump module, check the canister pump module interior, canister interior and related pipes for water, fuel and other liquids. If liquids are present, check for disconnections and/or cracks in the following: 1) the pipe from the air inlet port to the canister pump module; 2) the canister filter; and 3) the fuel tank vent hose. If liquids are present in the canister interior, replace canister and canister pump module together. Check for filter blockage in the canister. If the charcoal filter inside the canister is clogged, replace the canister and canister pump module together. Check for filter blockage in the canister filter. if the canister filter has blockages, replace the canister filter. (a) Replace the purge VSV (See page ). (a) Check that the EVAP purge port of the intake manifold is not clogged. 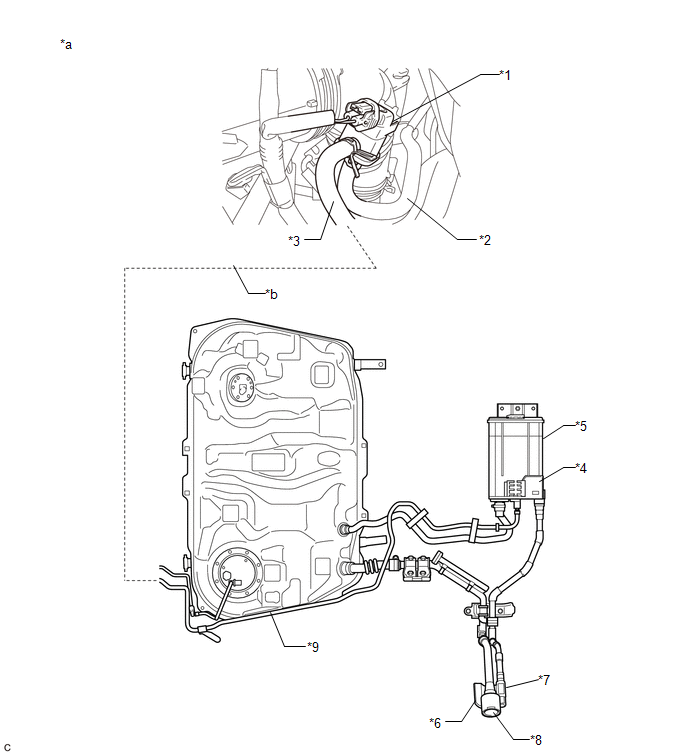 If necessary, replace the intake manifold (See page ). (a) Repair the malfunctioning areas indicated by the DTCs that had been confirmed when the vehicle was brought in. Do not run the engine in this step. When the temperature of the fuel is 35°C (95°F) or more, a large amount of vapor forms and any check results become inaccurate. When performing an Evaporative System Check, keep the fuel temperature below 35°C (95°F). (d) Clear the DTCs (See page ). (a) Replace the ECM (See page ). (a) Replace the canister (See page ). When replacing the canister, check the canister pump module interior and related pipes for water, fuel and other liquids. If liquids are present, check for disconnections and/or cracks in the following: 1) the pipe from the air inlet port to the canister pump module; 2) the canister filter; and 3) the fuel tank vent hose. If no pending DTCs are found, the repair has been successfully completed.